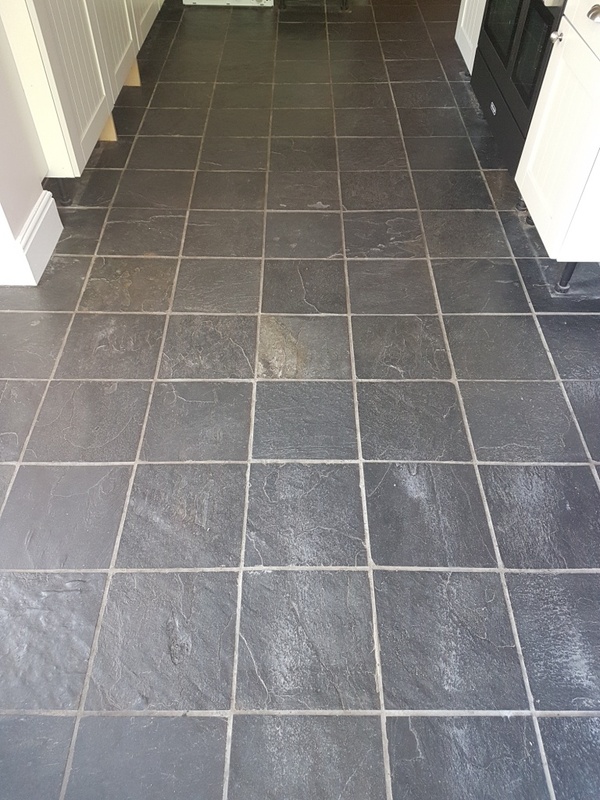 The photographs below are of a Slate Tiled floor in a house in York, a walled city in North West Yorkshire which is very famous for its Viking heritage and its many landmarks, including the stunning York Minster. 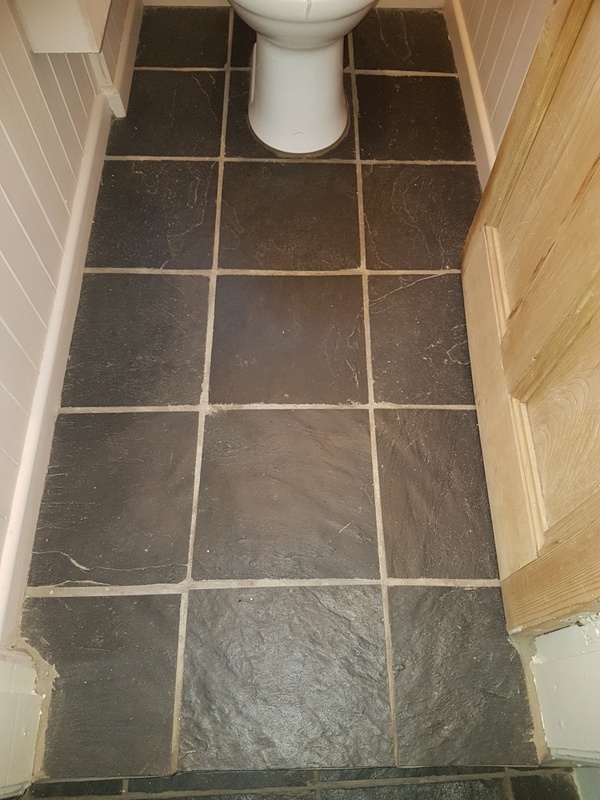 I visited the client to discuss what could be done to improve the look of the slate tiles which were installed in the kitchen and run into the downstairs cloakroom WC. I could see that the floor was suffering from the usual problem of dirt becoming ingrained into the pores of the stone making it difficult to clean effectively. This happens as the protection provided by the sealer wears off with use and the stone becomes dull and lifeless with the trapped dirt; additionally, the floor had some bad scratches from chairs being dragged across the floor. Being a Kitchen, the area was in used to high family traffic, so it was in need of some care and attention. The client was happy to go ahead with my quote. I arrived the following week and started by taping up and protecting the surrounding areas and thresholds. Then working in sections, I applied a strong dilution of Tile Doctor Pro-Clean (1 part Pro-Clean to 3 parts water) to the floor and left it to soak in and get to work breaking down what was left of the old sealer and dirt. This is a multi-purpose cleaner which works hard on stubborn areas. It was then scrubbed in using a black scrubbing pad fitted to a rotary floor buffer. I then used more Tile Doctor Pro-Clean on the grout which was stained in places and this was scrubbed in by hand using a thin stiff grout brush. The floor was then rinsed with water, and the now soiled cleaning solution removed with a wet vacuum before moving onto the next section. We try and keep the mess to the absolute minimum. 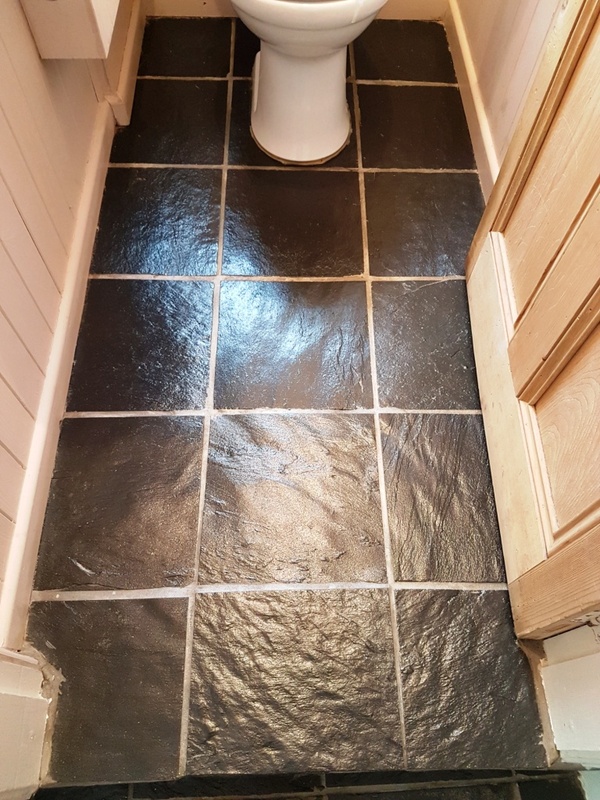 One area included a downstairs WC which was too tight to get the floor buffer in so there was no option but to scrub the tiles and grout by hand. 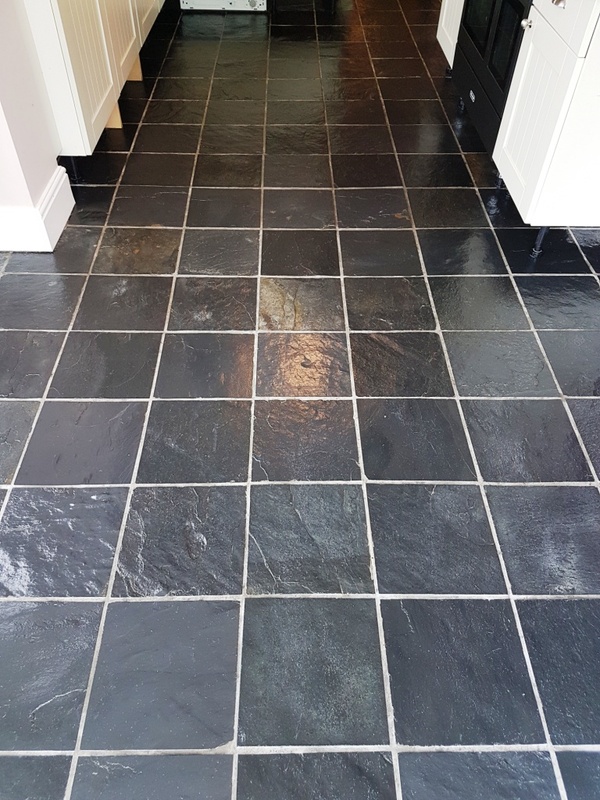 After cleaning all the slate and grout I inspected the floor and was pleased to see that the scratches were a lot less obvious after cleaning, so I suspect it was the old sealer that had been mostly affected. Had the scratches been deeper we would be looking at resurfacing the stone with milling pads which is a messy and more expensive process. The client was very pleased to hear that wouldn’t be required. After a final rinse the floor was looking much better already and was left to dry off overnight aided by the hot summer weather. I returned the next day and checked the floor was fully dried out by using my moisture meter. All the readings were fine so the lovely weather had done its job which was much appreciated by myself as this greatly helps the floor cleaning process. I applied four coats of Tile Doctor Seal and Go which is a water-based sealer (so no smell) that leaves a lovely deep lustre to the floor. The scratches had all but disappeared and I was able to get on with the job quite quickly due to the bonus weather that helped he sealer dried a lot quicker than usual between each coat. The customer was very pleased with the finished floor, and I think you can see from the pictures how much better it looks. It will be much easier for them to clean and maintain in the future.